Scan the barcode value on an asset (or attach one, if there’s not one on it already) and then enter associated text to describe that asset – we call it ‘Response’ text. When that scan is submitted to our servers it is added to your asset database or, if the asset was already in there, then it will replace the Response text previously associated with it. The process is the same as for Asset Tagging but here you would update (edit) the Response text to indicate the current condition or location of the asset. If you create your own barcode tags (labels) using 2D barcodes (e.g. QR, Data Matrix or PDF-417) and embed descriptive information in those barcodes, then the Response text can be used solely for status updates. Database Builder is ideal for applications needing to directly update your asset or ID validation database. The trade off with this simple builder is the app-user input can only input text to a single form field. Alternatively, when using a standard Record Scans service type you can prompt the app-user for multiple form entries, secondary scans, photos, signatures, GPS locations, etc. with each scan. However, this Records Scans data does not update directly to your validation database; instead, you need to export those scan records and re-import them to your database unless you use the Postback option (see below). a) Export, filter and share scan records in template form using the codeREADr ‘Scans’ page and then import those records into your external database(s). b) Auto-insert scan records into those external databases. c) Schedule filtered uploads via FTP/SFTP and exports via email. d) Developers can use Postback, DSU and our API. a) Scan barcodes and be prompted to enter data based on a wide range of prompts you configure for the service. The resulting record will be added to the validation database. 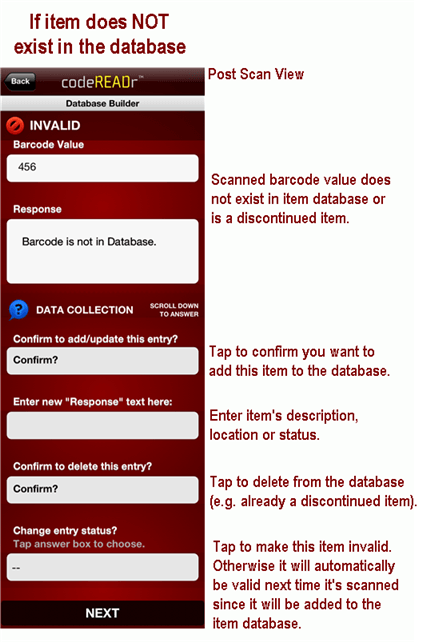 b) When the app user subsequently scans those barcodes they can view and update the previously entered data. Please look here for detailed instructions on database builder with postback.